It’s back to Magic Kingdom for the next of our Walt Disney World construction progress and random park updates. Even though it’s not yet December, it’s been Christmas for nearly a month here. With temperatures the last couple of days falling, it has actually felt like the holidays, too. We attended the Christmas Party this week, and arrived early for some photos for this update. We’ll have a full report from that night next week, or you can revisit our first 2018 Mickey’s Very Merry Christmas Party Photo Report for more on our yuletide experiences this year in Magic Kingdom. We’ll start with the biggest non-update update. We didn’t see any visible progress on the Tron Lightcycle Power Run construction area. Granted, unlike in our October Magic Kingdom Update, this time we did not visit Top of the World Lounge at Bay Lake Tower for a faux aerial view. This time, we walked around inside Magic Kingdom, where not much is visible from Tomorrowland or Storybook Circus. Speaking of Tron Lightcycle Power Run, you’ve only got a few more days to experience the Walt Disney World Railroad before it goes down for an extended closure of potentially over a year on December 2, 2018. Sticking with Tomorrowland, we have the best type of progress of all: invisible progress. Or rather, work that has been completed. The removal of Monster’s Inc. Laugh Floor’s marquee and an ornamental UFO type detail is now finished. Space Mountain’s permanent exit has reopened with the removal of the SpeedRamp completed a week or so ago. I forgot to get photos of this the first time we did it. I couldn’t score another FastPass+ and there’s no way I was going to wait 40 minutes for you all to have a photo (that are already floating around online if you just Google it) of the new walkway that looks just like the old one, less a SpeedRamp. After what seemed like a never-ending project, the walls around Prince Charming Regal Carrousel are down. Contrary to some “rumors,” it was not converted to a double-decker. Oh well–next time. Just a reminder that the trees directly in front of Haunted Mansion have been replaced with smaller trees, revealing the facade in all its foreboding glory. On your next visit, take the chance to savor the up-close view of Haunted Mansion’s facade. We missed it, but Liberty Belle Riverboat finally returned to Liberty Square following a refurbishment that drained the Rivers of America and has suspended operation of the Riverboat for most of the year. The Riverboat has still yet to officially return, but we believe it’ll begin operating December 22, 2018 (just in time for Christmas week crowds). Sarah has been eating Walt Disney World vegan burgers for, according to her, the sake of research. No one asked for this, but I guess we’ll turn it into a post at some point? Ye Olde Christmas Shoppe’s refurbishment is now finished, as the year-round Christmas shop enters its peak season. Unsurprisingly, ornament personalization is a big thing this time of year. This is one of the best additions to Walt Disney World in the last decade–if you haven’t seen it, do yourself a favor and catch it on your next trip. It’s great this time of year when the temperatures are a bit cooler. On a semi-related note, we’re sad to report that Magic Kingdom is not presenting one of the all-time best pieces of Walt Disney World entertainment this holiday season. That’s right, I’m talking about Country Bear Christmas. This marks the [checks notes] 13th consecutive year the holiday version has not run. Okay, so not exactly breaking news at this point, but we feel it’s worth pointing out, especially for newer fans who might not realize this attraction overlay was offered to begin with. Country Bear Christmas is still performed at Tokyo Disneyland (as Jingle Bell Jamboree), and we have a tribute post featuring a synopsis of the show plus tons of photos. We absolutely love this show. It’s our favorite seasonal overlay, and the main reason we visit Japan during the holidays. No joke. *Offer valid until November 30, 2018 at midnight EST. Meanwhile, Jingle Cruise survives despite being cut in California. We have nothing against this overlay. It’s no Country Bear Christmas (then again, nothing is), but it’s a cute seasonal offering with hit or miss humor. So, more or less Jungle Cruise, but for the holidays. Here’s something about Christmas in Magic Kingdom that absolutely should be cancelled: this circa 1985 Christmas tree. I have no clue when it’s actually from, but I’d hazard a guess it’s old enough to run for president. Since this tree debuted at Magic Kingdom, Disneyland has replaced its Christmas tree approximately 39 different times (probably). Look, we all made some style faux pas back then; the 80s were a wild time. I had lasers in my yearbook background and wore a Rescue Rangers jumpsuit along with knee high socks. However, rather than repeating these same mistakes, I’ve moved on (to new and different regrettable fashion choices). Magic Kingdom should be allowed to do the same–it’s beyond time for a new Christmas tree. How Magic Kingdom gets stuck with the worst and most outdated Christmas tree at Walt Disney World is beyond me. This is Walt Disney World’s flagship park, and one with a paid holiday event that should help ‘subsidize’ the cost of a replacement. In another note of unbridled positivity, I really like the Christmas window displays at Magic Kingdom. This is another thing mentioned in the Epcot update, and it holds true here. Be sure to spend some time perusing them–especially the Mickey’s Christmas Carol ones in the Emporium. All in all, not the most exciting update, which may make for an unexciting read, but should make for a better in-park experience. A lot of the work that we’d been watching for the last several months has wrapped up, and Magic Kingdom is looking great. Main Street is scrim-less and beautiful (minus the tree…and lack of garland), Tomorrowland is devoid of tacky banners and random walls, and the rest of the lands are also looking good and mostly construction-free. We’ll be back with another update sooner rather than later, so stay tuned for that! Thoughts or insights about current construction projects in Magic Kingdom? Do you miss Country Bear Christmas? Thoughts on the Magic Kingdom Christmas tree? Any questions we can help you answer? Hearing your feedback—even when you disagree with us—is both interesting to us and helpful to other readers, so please share your thoughts below in the comments! Pretty stoked about this vegan burger post! My favorites are the beyond burger at ABC Commissary and the Impossible burger at the Edison. I would LOVE to read a post about all things vegan at WDW. My family and I are vegan and going to be there Dec 12-18. Nothing I’ve read from anywhere on the internet is organized. This website lists vegan options by park or resort! They don’t post reviews for everything, but their instagram shows pictures of a lot of these items. Hi! We have tons of reviews as well as options listed on our blog. Be sure to check it out before your next trip. I agree the Magic Kingdom tree needs updating–honestly I feel like they all could be refreshed as we’ve been multiple Christmas seasons now and it’s a bit too repetitive (someone’s idea above of rotating between the Disney resorts might be a good way to keep things fresh but costs down some even). I’d love to see the Christmas Bear Jamboree overlay but I have not. Thanks for the updates, as always! If Sarah wants to take on another venture “for research,” we always love more feedback on various allergy menus and allergy-friendly foods (including gluten). I have celiac and a peanut allergy, so just thought I’d throw that request in the hat! I’m a former CM but I can’t remember, and can’t find the answer anywhere! Space Mountain’s exit was surprisingly dangerous. On our 2015 trip, we had our trio of 8 year olds on the exit ramp, which was full. A wheelchair in front of us got stuck where the walkway ended. There were hordes of people behind us. We really thought we were going to get crushed. It sounds almost comical, but my husband picked up one kid and was going to kind of toss him over the group that was stuck. I started trying to run backwards with the other two. Just as we all converged they got the wheelchair unstuck, but my adrenaline was running after that. So we are happy to see that exit updated. This is almost identical to the story I heard regarding what necessitated the change. I have watched a video of the Disneyland Jingle Cruise and thought it was better than WDW. Not necessarily the jokes by any means but the decorations … everything was decorated, even the elephants, much better looking over all. I wish that all of the Disney parks (ALL of them) had an exchange program … not for employees but for decorations. California is tired of their Halloween/Christmas stuff, trade with Florida or Tokyo, etc. Easier said than done but I can always dream …. Why feel the need to address people’s response to your criticisms? People are allowed to disagree. No need to get offended over it. If it bothers you that much, maybe don’t have an open discord? I will miss the Space Mountain speed ramp! I have never experienced CBJ Christmas since I didnt go to WDW for the Christmas season until 2013. I love the show though as its regularly on my Christmas playlist. Thank god for YouTube and Disneyland 50th Anniversary album. Question though: the photo of the facade of Haunted Mansion seems to have been taken from an elevated POV. Where did you take that from? Don’t feel sorry about criticizing this “rapacious, soul-less conglomerate,” as Roy Disney said of it. The Simpsons totally nailed their absurd tourist trap business model. It’s more interested in gobbling up other businesses, marking up prices (6x the opening, adjusted for inflation), creating boring starchitect hotels and doing massive buybacks (TENS of BILLIONS of dollars) than update its parks (they’re actually making money, unlike their media division). 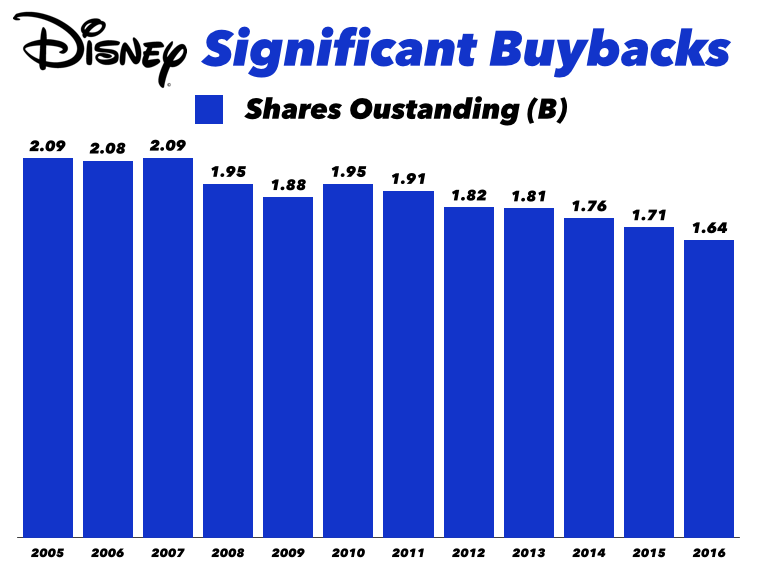 Yep, just take a look at the number of stock buybacks since 2005. It’s insane that they cry poor and have you people believe it. The Magic Kingdom was not designed for the massive attendance it gets and they create no new capacity. The park should be way bigger by now and the food should be way better. Going there is like a creepy time travel journey because it’s so living in the past. Hollywood Studios has been an overflow afterthought (they have been charging full price for a half-day park) but they’re finally expanding it. Animal Kingdom couldn’t even get the Epcot aquariums and they chickened out building it. Disney World is kind of a disaster with extremely poor planning and incompetent management. They can’t even do some more thrills rides in these parks to attract different ages. The transportation and sprawl is total idiocy. You can’t even walk or bicycle to most things! Take a look at the East if you want to see real development. They build 57-story skyscrapers in 19 days. Here, all we get are overpaid people making excuses and taking decades to accomplish anything. Disney World is like a microcosm of our own country. Rates of real net domestic investment have been abysmal and working-age male participation rates (age 25-54) have kept falling steadily since mid last century. No, Ebenezer Scrooge. People have no idea how much buybacks since Reagan have damaged investment in the US. I, for one, am totally here for the vegan burger article!That is exactly the kind of research I need. I will note, however, that putting cheese on a vegan burger makes it not vegan and may cause results to be misleading. Thank you for your dedication to science! Thanks! Sounds delicious. Where is it? What is changing with Monsters, Inc.? Is it not there anymore? I was there this past June and it was carrying on with full force. Wasn’t it Stitch’s Great Escape that needed a replacement? Is there anything at all to do in the Tomorrowland main passageway now? And, for the record, your humor is spot-on delightful for me. Always a pleasure to read! Did you get A’s in English? The Laugh Floor attraction is still there, it’s just the marquee that changed. Oh! Hark! Thank the Lord. 🙂 Appreciate the quick response. I was distressed. Speedramp aside, what’s your take on how the new Space Mountain exit looks? Photos are not flattering. I think it looks fine. The key part to me is the scenes that were added during the major overhaul (in 2009, I think? ), and those are all intact. The green-screen is gone and there’s some art further up, all of which seems like a mostly lateral move to me. It can’t quite be seen in the picture: what’s actually wrong with the Magic Kingdom Christmas tree? I can’t see anything overtly 80s about it here, and on my last visit to WDW it was still up and I don’t recall noticing anything problematic about it (though I admit I didn’t attempt a crticial review). The oversized strands of popcorn, the look of the presents underneath, the style of the other ‘toy’ ornaments–even the bulbs are dated. I really dislike the overall look–perhaps to an irrational degree. Count me as excited about the removal of the speedramp. Maybe I just had incredibly bad luck, but I feel like whenever I got off Space I *always* got stuck behind a massive, immobile, impassable blob of humanity that sprawled out across the ramp from its start to just before you entered the shop. Although I don’t think the “declining by degrees” complaint is completely invalid, to me I think most of the complaining is from people who liked parking themselves on that ramp instead of using their feet; there certainly seemed to be a lot of them in any case! Judging by the amount of people using the electric wheelchair scooter things at Disney, I would say that most visitors to the park do not want to use their feet! That is an awful assumption on your part. If you have EVER had to use an electric sccoter, you wouldn’t make that complaint, If I could walk the parks, I would be so grateful to do so!! In the scooter I am separately from my group most of the time, cut off by people walking RIGHT in front of me! Walking toward me and don’t move, but there is no room for the scooter to go as it is busy, so I come to almost a complete stop, so the person may pass so I don’t hit them with the scooter, I get those “looks” at the bus stops when it’s time to load and unload, assuming I can walk if I wanted to, by people like you, I wish I could walk. I can’t imagine anyone going through all that just because they want to ride a scooter, You can get around faster, stay with your group, hold hands with your grandchild, or child. Look around a bit while walking. Stop in an instant. I’m offended by your statement Matt. Not that you would care. It’s a shame that you, someone who needs a scooter, is offended by my statement which was (not clearly) directed towards people using them and don’t need them or shouldn’t need them. My statement was more aimed at the 400lb people drinking 30oz Starbucks with the works while being loaded into a bus. The service IS wonderful and it’s great that people who need them can, for the most part, get around the parks to enjoy them and time with family. I also agree that people everywhere, not just at Disney parks, should be more considerate of other people’s space and mind where they are going.